Broc Feeney heads to this weekend’s third round of the Toyota 86 Racing Series at The Bend Motorsport Park aiming for a podium finish to build on his strong top five result at Townsville. Unlike Townsville – where his top five was even more remarkable considering he lost a practice session with a technical issue – Feeney arrives in South Australia having completed many laps of the circuit in his #93 Firestar Developments/Marriott Vacation Club-backed Toyota 86, taking part in a State Racing event earlier in the year and testing on the 4.945 kilometre circuit just last week. The Toyota 86 Racing Series is a key support category to the first ever OTR SuperSprint for the Virgin Australia Supercars Championship. 15-year-old Feeney from the Gold Coast was a sensation in the final race of the previous round in Townsville as he charged his way forward to a storming top five finish. With the Championship hitting a critical phase at its halfway point, the huge Marc Marquez fan (hence his race number #93) will also be looking to solidify a place inside the Championship top 10 to setup a strong second half of his year. The Bend is Australia’s newest race circuit and the nine figure, private development is located around 96km from Adelaide’s CBD. At its full ‘GT’ length the circuit is the second longest circuit in the world behind the Nurburgring Nordschleife. The OTR Supersprint event will use the abridged version. Feeney has been spreading the word for the Toyota 86 Racing Series over recent weeks, taking part in an ‘open day’ for TAFE Queensland at a Gold Coast TAFE campus, where his Toyota 86 Racing Series car was front and centre at the entry way for the exhibition, which attracted over 2000 prospective students – he’s also been featured in a number of media pieces surrounding his vocational studies talking up the competitiveness of the Toyota 86 Racing Series. He also took part in the most recent round of the SP Tools Australian Kart Championship in Emerald, Queensland – and will round out that Championship next weekend in Melbourne. All of this weekend’s Toyota 86 Racing Series competition will be carried live on Fox Sports 506. The event consists of two practice sessions Friday, a qualifying and two races Saturday and a single race on Sunday. In addition to Firestar Developments and Marriott Vacation Club, Broc Feeney has additional support from the Paul Feeney Group, Labrys, Penrite Oil, the Norwell Motorplex and TAFE Queensland. “I really think that we can push forward after Townsville’s results this weekend,” said Feeney. “I’ve tested and raced at The Bend on the configuration we’ll be on and my confidence in the Firestar Developments #93 is stronger than it has been before given the extra time we’ve had behind the wheel. “That time, plus working on more technique with Paul Morris at the Norwell Motorplex, has me feeling more ‘rounded’ and prepared as we head there. “The track is one of the best I’ve seen, it has a real European feel about it and nothing has been left unturned when planning the facilities. The circuit is a long one at 4.945 kilometres and it really tests you out. “We’ll be halfway through the Series at the completion of the weekend, so it is important that we maximise the amount of points at Tailem Bend to set us up for Sandown, Bathurst and Newcastle. 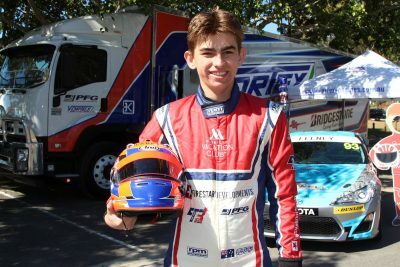 “It has been a busy time between testing and karting for the Paul Feeney Group Race Team and next month doesn’t slow down with the end of the Australian Kart Championship then Sandown two weeks later. Plus, add in school and planning for next year and there is a bit going on! “I wouldn’t be able to do this without the support of the guys at Firestar Developments along with Marriott Vacation Club, Paul Feeney Group, Labrys and everyone else that has shown their support to us this year.